The Howdah Pistol is a reproduction of the famous Auto & Burglar model made by Ithaca Company around 1920. This modern version features rifled barrels chambered for .45LC/.410 (3 inch shells) and it is sold as a pistol. The Howdah features: tang safety, manual shell extractors, flip-up rear sight with brass bead front sight, and a checkered walnut stock. 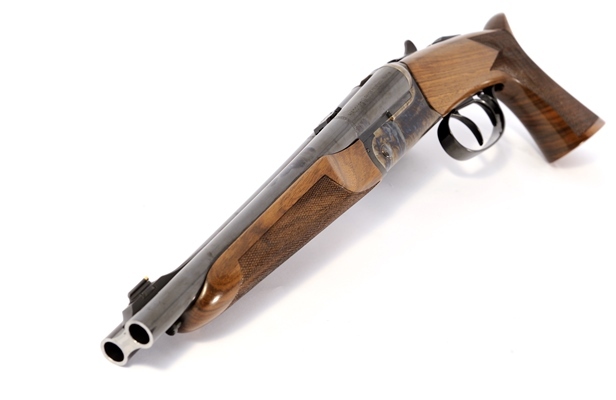 The action works by cocking the internal hammers when the action is opened, on the Original and Alaskan models, and it has double triggers to select which barrel to fire (front trigger for the right barrel and rear trigger for the left barrel). The Vintage Howdah model features a non-checkered pistol grip, external hammers, and browned octagonal barrels. The Alaskan Howdah model is upgraded with a plow handle style pistol grip, walnut stock with black rubberized coating, and a matte chrome finish. Requires an FFL dealer to ship.